Lake Brienz (Brienzersee) is a picturesque body of water in Switzerland. Close to it is the picturesque town Interlaken. As its name suggests, it is situated between the mountain lakes - Thun and Brienz, at 566 m altitude. The panorama is made up of beautiful views of the most famous parts of the Alps – the peaks Jungfrau (4158 m), Mönch (4099 m) and Eiger (3970 m). Here are the famous winter resorts Wengen, Mürren, Stechelberg and Grindelwald. 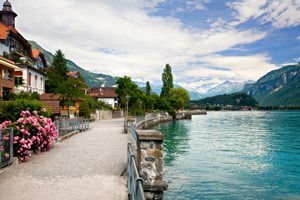 Lake Brienz or Brienzersee is one of the nicest tourist attractions in western Switzerland. Lake Brienz is situated about 80 km southeast of the capital Bern. This water pool with crystal clear water stands east of Interlaken. Typical of some of Switzerland's most beautiful landscapes, these views are accessible only by rack railways. If you want to enjoy the view from above Brienz, you need to climb the rope train, which is in no event in your in minus. 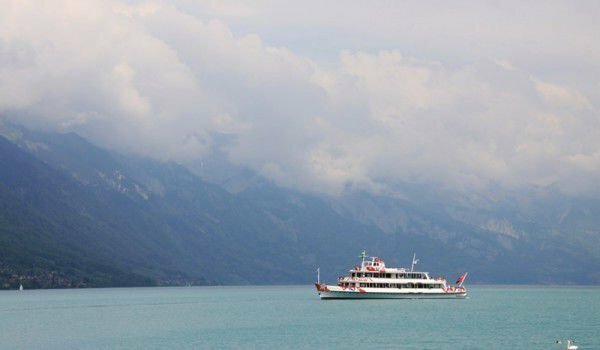 Lake Brienz is extremely hospitable to tourists. You may go boating or canoeing, walk along its shores, and even indulge in sunbathing. Locals claim that the water temperature reaches 20-21 degrees, which is more than perfect for swimming. The biggest attraction of Brienz remains the toothed rail, which is only 15 kilometers from Interlakten. This attractive train is locally known as Brienz Rothornbahn and is considered the oldest in Switzerland. It has been operational since 1892. The displacement that you will overcome during the train journey on Lake Brienz is 1678 m, consisting of great views. Lake Brienz itself gets its name from the homonymous village, situated on its northern shore. Matten and Unterseen villages are located on the southwest edge of the lake. All of Brienz’s shores are steep and there is almost no shallow water throughout the lake. This basin is the first lake, which extends River Aar. The next section is in Lake Thun. Lake Brienz is formed 564 m above sea level. Its length is about 9 miles, its width 1 ½ miles. Estimated maximum depth is 856 feet and the area of Brienz is 11 ½ square miles. A little unusual, but Lake Brienz is poor in nutrients, so fishing here is not a widely spread practice.